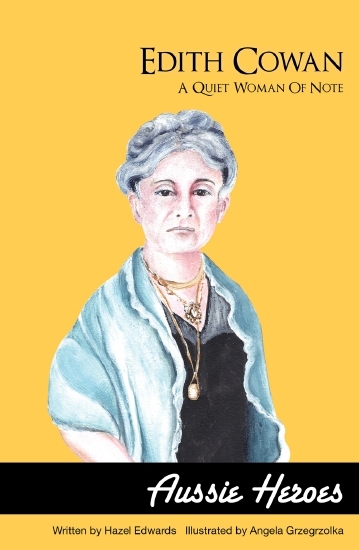 Edith Cowan overcame a violent past, dedicating her life to social and political reform, and eventually became the first woman elected to Australian parliament. I was born in Brisbane and have mostly lived here ever since, other than a few years living on the Gold Coast for my first teaching post. I attended Camp Hill Infants, Camp Hill Primary and then Coorparoo High School. Growing up, my best friend's dad always called me Sparrow as I had skinny little bird legs. I was mostly hard working and very well behaved but had a penchant for talking too much. A trait that holds to this day. I was a very finicky eater and dinner time was a battlefield. I hated conflict but hated mashed potato even more, so each night I would find an excuse to leave the table to smuggle my dinner to my dog. She would wait loyally on the top step for me and cleaned up all the evidence. My mum never caught on. Any wonder I had those skinny bird legs. I devoured any book I could find and once my nose was in a book, no one bothered trying to speak to me. It's hard to pick a favourite, though I do remember being particularly delighted by an old yellowed copy of Little Women which I found in an old box at the bottom of a storage cupboard. I love Colin Thompson. His sense of humour is irreverent and refreshing and his illustrations delightful. My daughter loves his books too, which is fortunate as I can pretend it is her I am buying them for. My favourite food is chocolate...whose isn't? My favourite colour is orange as it is so vibrant and happy. My favourite movie is Mamma Mia as I must confess to being an Abba tragic from way back. I suppose the many children I have taught art to over the years have been my biggest inspiration to illustrate. Their enthusiasm to watch me draw and to absorb anything I created was very good for my self esteem as an artist. I love creating for children. What better way than to illustrate children's publications. I wrote and illustrated a children's picture book for my daughter Abi. I sent it to several publishers in the hope of having it published and this resulted in being added to the file of illustrators for New Frontier. I am now illustrating my second book for them and have also illustrated for an educational advisory company, who knew of my artwork through my teaching background. I was in my mid-forties but had been making art for decades prior. Why did you want to be a illustrator? I love to create and I love the enthusiasm children have for creative pursuits. Illustrating for children is the perfect fit. Sometimes they just pop into my head all of their own accord and sometimes I have to sit and ponder and look for visual queues in my environment. When I begin to work on an idea it often morphs into something completely different from the initial vision. You never know where you might end up. I illustrate at home at my dining room table. My family rarely sit there for dinner as it's too covered up in my art materials. I have just purchased a whiz-bang drafting table which is meant to be perfect for my projects, but I prefer the huge space my big dining table gives me to spread out. What is the best thing about being a illustrator? I love the first moment I see a new publication I have illustrated for. It is such a sense of achievement to see your work appear in published form with your name on the front cover. Have you had any funny or embarrassing moment as a illustrator? Not yet, but there's still plenty of time for the inevitable to happen. I always manage to embarrass myself eventually. I have volunteered my time just recently to provide artistic guidance for a group of year 6/7 children at my daughter's school. My teaching background finds me frequently back in schools helping out voluntarily. The remainder of my time is spent caring for my family and my elderly mum, who lives with us. I would still be teaching art to primary school children and making my fine art, which I still do. I would like to talk to Mary MacKillop, the subject of my last illustration job for New Frontier. Her selfless life saved many from the grip of poverty by providing the opportunity for education. She faced many adversities in her life, but never gave up her on her mission. Her resilience and perseverance have long been an inspiration to me.